Say what you will about bed bugs (Cimex lectularius), they’re certainly a worthy six-legged foe. A new study published Wednesday in the journal PLOS-One has found that bed bugs are fighting back against our commonly used insecticides partly through a remarkably simple strategy — by growing thicker skin. More accurately, they’re growing a thicker cuticle, the term for its tough fingernail-like exoskeleton. 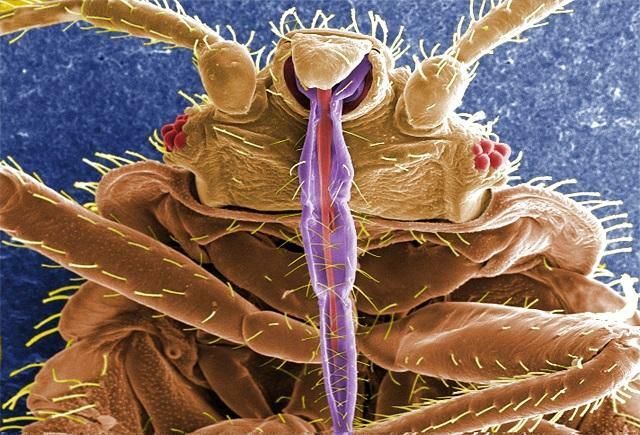 The study authors, primarily hailing from the University of Sydney, closely examined bed bugs with some of the sharpest magnifying glasses available to scientists, a scanning electron microscope. “Using scanning electron microscopy, we were able to compare the thickness of cuticle taken from specimens of bed bugs resistant to insecticides and from those more easily killed by those same insecticides," said David Lilly, the study’s lead author and a PhD candidate at the university, in a statement. They found that the more insecticide resistant the bed bugs were, the thicker their cuticles were. “This may help to explain why failures in the control of field infestations are so common, and further emphasizes the need for an integrated approach in the control of bed bugs to prevent the further spread of highly resistant insects,” Lilly and his co-authors wrote in the paper. Bed bugs have been making a frightening comeback in our homes and workplaces since the turn of the century. While some of that rise can be tied to greater global travel and the abandoned use of more harmful but powerful pesticides like DDT, it’s mostly because they’ve steadily become resistant to the main weapon we use against them, a class of pesticides called pyrethroids. If we’re at war with the bed bug, then it’s one we’re slowly but surely losing for the time being (though there are new weapons in the pipeline). The difference in thickness was seen both when comparing bed bugs belonging to a modern-day strain already resistant to pyrethroids to one another and when comparing them to a preserved strain from the 1960s that was completely susceptible to the chemicals. The most resistant bugs on average had a cuticle 16 percent thicker than their least sturdy counterparts. Although the study is purportedly the first of its kind to explicitly tie cuticle thickness to resistance in bed bugs, the authors noted that thickening has been seen in other now-resistant bloodsucking insects, like the mosquito most responsible for malaria in Africa, Anopheles funestus. Elsewhere, researchers have begun to identify the mutated bed bug genes responsible for resistance, the majority of which are expressed in the cuticle. The authors theorize that these mutations may be responsible for cuticle thickening. It may also be the case that thickening itself, in conjunction with these mutations, could provide a buffer against insecticides by making it harder for them to penetrate the bed bug’s innards. Figuring out exactly how these different ruses work together is crucial, according to Lilly. "If we understand the biological mechanisms bed bugs use to beat insecticides, we may be able to spot a chink in their armour that we can exploit with new strategies," he said. While the authors would ideally like to expand this specific type of research to both common and tropical species of bed bug, they lamented that scanning electron microscopy is a particularly costly technique to use, costing upwards of $5,000 per every strain of bed bug they looked at. Still, they do plan to further study a wide range of resistance mechanisms in the bed bugs native to Australia. For Lilly, the research was particularly aggravating at times for other reasons. "The findings are exciting but collecting data was frustrating. Taking microscopic measurements of bed bug legs requires a steady hand and patience, lots of patience," he said.